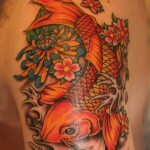 Koi fish represents a traditional design of tattoos in the Japanese and Chinese culture. 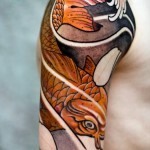 In China and Japan, the koi fish is an ancient symbol of masculinity and strength. 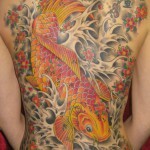 Legends tell that the koi fish were climbing the Dragon Gate waterfall on the Yellow River in China. During the ascent, they turned into dragons, as evidence of success and reward of their endeavor to fight the forces. 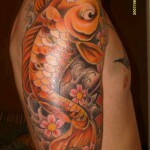 The koi fish is a symbol of perseverance in the face of life adversity and strength of character, it can signify wisdom, knowledge, longevity and loyalty. 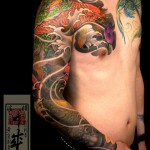 In the design of tattoos, especially in combination with flowing water, koi symbolizes courage, crossing obstacles and fulfilling life goals. 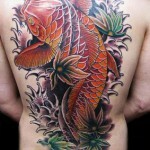 Many people choose to have a koi fish tattoo because of the strong significance of the legend. 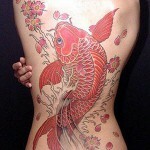 The design of the koi fish can be simple or can represent the journey from fish to dragon. 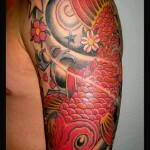 The most common place to put the koi tattoo is the upper arm and majority choose to do a tattoo sleeve using all the elements of the koi fish myth. 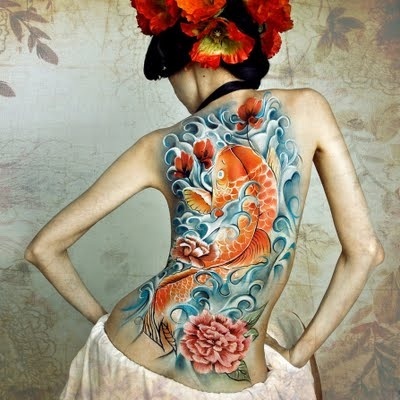 Their color varies from golden yellow to orange, but as always it’s your choice to choose the colors that best represents you and your tattoo design. 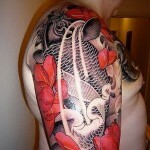 Dragon koi fish tattoos – this design tells a story. The legend says that koi fish who has the strength to climb a waterfall and to reach the top will transform into a dragon. 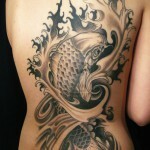 Yin yang koi fish tattoos – the symbol of yin yang is very popular in the Japanese culture as well as the koi fish. For the representation of this design are used two koi fish to create a circle, as we all know that the circle of the yon yang design is symbolic. 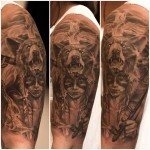 You can do this tattoo in black and white. 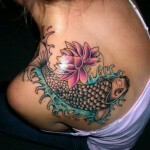 Lotus flower and koi fish tattoos – the lotus flower and the koi fish in the same design have a deep meaning. 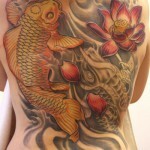 The lotus flowers symbolize beauty, purity and rebirth. 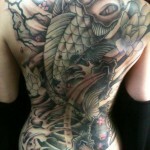 Putting them along the strength and courage of the koi fish the design sends a powerful statement.